PNY is proud to sponsor Military & Aerospace Electronics’ Executive Briefing: GPGPU technology ushers-in a new era in embedded computing. The Briefing includes articles on how GPGPU technology is revolutionizing high-performance embedded computing (HPEC) in aerospace and defense applications. Visitors to I/ITSEC 2018 can meet with our Partner RAVE (Booth #700) to discuss their NVIDIA embedded GPU needs and FoxGuard (Booth #2123) to see the new NVIDIA Quadro RTX 6000 bring stunning realism to an advanced flight simulator. 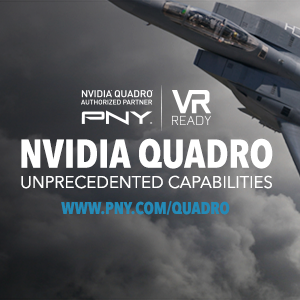 NVIDIA Quadro GPUs, including NVIDIA Quadro MXM Embedded and GPU Down Solutions, provide the extreme graphics and compute performance demanded by mission-critical aerospace and defense applications. This week at I/ITSEC, the world's largest modeling, simulation, and training conference, which emphasizes themes related to defense and security, attendees are invited to visit PNY Partner’s RAVE and FoxGuard’s booths. Visit RAVE (booth #700) to learn how NVIDIA Quadro GPUs, including Quadro Embedded GPUs are integrated into RAVE’s purpose-built computer hardware solutions optimized for the Modeling, Simulation and Training industry, offer unmatched performance and features. FoxGuard (booth #2123) is demonstrating why and how the NVIDIA Quadro RTX 6000 professional graphics board is ideal for simulation and training applications where rendering is an essential component of the solution, and AI can be utilized to deliver more innovative, cost-effective, and transformational solutions.